Beginning November 30, 2018 the Munich-based Salon for Culture and Communication (Salon für Kultur und Kommunikation) will be presenting “Gift Ideas” (“Geschenkideen”). 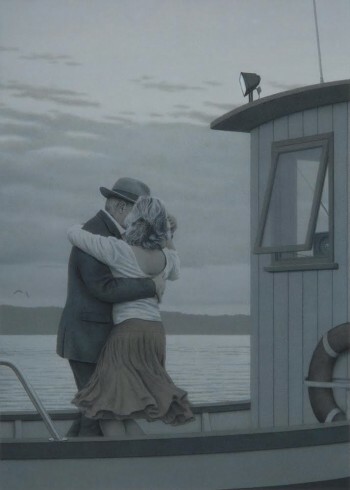 The eclectic exhibition of paintings, fashion, jewellry and objects by different artists and designers, scheduled to end on January 18, 2018, will also include a selection of limited and signed fine art prints by Quint Buchholz. Information about the vernissage and finissage is also available on the Salon für Kultur und Kommunikation’s website. November 30 2018, 7 p.m.
January 18, 2019, after 2 p.m.
December 1 & 2, 2018, 2-7 p.m.
Tuesday through Friday, 2-7 p.m.
Saturday, 11 a.m. – 3 p.m. In the context of the 20. 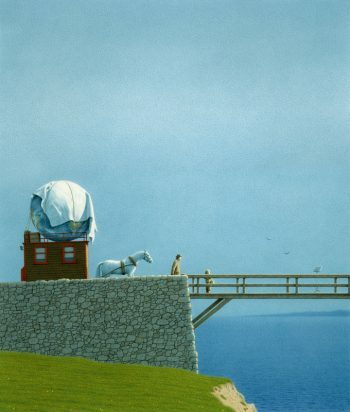 Austrian Premiere Days (Österreichische Premierentage), Innsbruck-based Gallery 22a is exhibiting original paintings by Quint Buchholz, from November 8 to December 15, 2018. 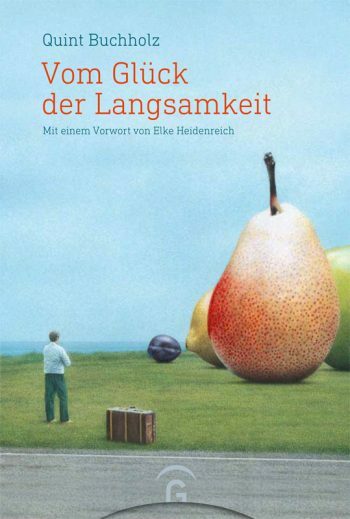 The exhibition titled “The Collector of Moments” (Der Sammler der Augenblicke) will open on November 8 with a vernissage event, during which Quint Buchholz will be speaking about his books. 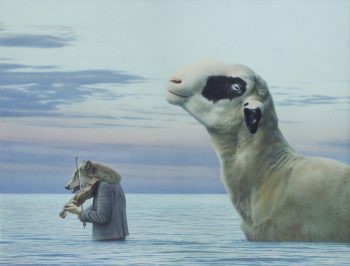 Additionally, Quint Buchholz will be a guest at the Innsbruck bookstore Tyrolia on the day before the vernissage. As part of the reading series “A Day Without a Book is like…?” he will be reading from his “In the Land of Books” (Im Land der Bücher), and he will be speaking about reading and his work as painter and illustrator in a subsequent workshop. The reading and the workshop are free but require prior registration. More information is available on the website of the Tyrolia bookstore. November 7, 2018, 7 p.m.
November 8, 2018, 7:30 p.m.
Monday through Friday 10 a.m – 12 p.m.
Monday through Thursday 2 – 5 p.m.
From November 15 to December 2, 2018 the largest regional book fair “Münchner Bücherschau” will take place at Gasteig library in Munich. One attraction at the fair will be the group exhibition “Eyes CLOSED? Eyes OPEN! Night in picture books” (“Augen ZU? Augen AUF! 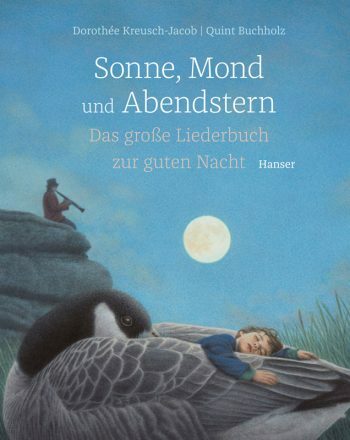 Die Nacht im Bilderbuch”), featuring original illustrations and night pictures by Quint Buchholz, Miro Poferl, Susanne Straßer und Britta Teckentrup. The exhibition will officially open on November 17 with an artists’ talk. The round-table open discussion with the participating painters, graphic artists, illustrators and authors will be hosted by Munich-based journalist and publisher Christine Knödler. Admission is free for both events. November 17, 2018, 5 p.m.
daily from 8 a.m. to 11 p.m.
From October 4th to 6th, 2018 the International Picture Book Festival “Čigra” is taking place, organized by the National Library Požega and the Goethe Institute Serbia. 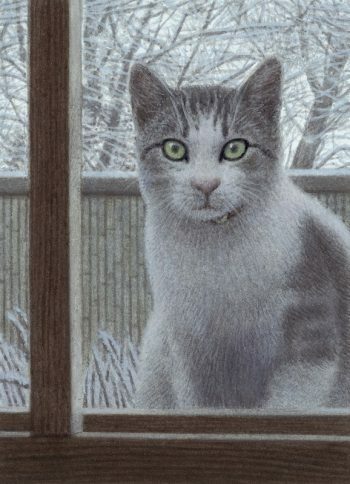 This year’s special guest is Quint Buchholz. 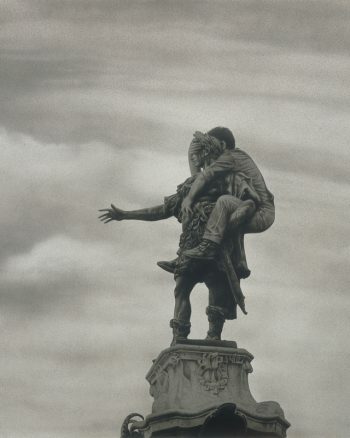 His pictures will be on exhibition at the National Library Požega. 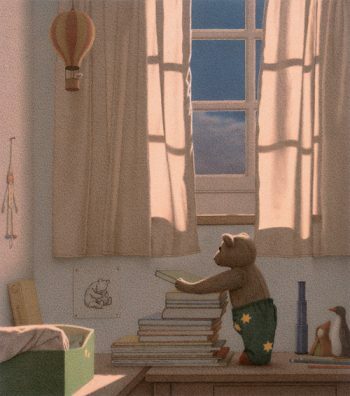 Moreover, Quint Buchholz will be hosting the Literature Café on October 5th, a talk and workshop for teenagers on the topic of “Picture Books for Adults”. More information about this event is available on the website of the Goethe Institute Serbia. October 5, 2018, 12 p.m.
On September 29 and 30, 2018 the Munich-based Vocal Ensemble Canzone 11 will once again bring to life the multifarious art form of the madrigal. On two evenings, the group of singers directed by music instructor Tanja Wawra will give two concerts, presenting emotional, virtuosic and curious choir music by the early composers Michelangelo Rossi and Clément Janequin, as well as pieces from the 20th and 21st centuries by Pelle Gudmundsen-Holmgreen, John Hoybye and Jaakko Mäntyjärvi. This exceptional choir performance will be accentuated by a projection of pictures by Quint Buchholz. More information about Canzone 11 and about the upcoming events can be found on the vocal ensemble’s website. And for a little pretaste, here is a video recording of Janequins “Chant des oiseaux”, performed by Canzone 11 during the “Eye Music” concert in June 2016. Admission and drinks beginning 6 p.m. Admission is 15€ (or 9€ reduced) at the door. 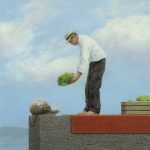 Gasthaus Domagk, a restaurant and meeting point for the residents of the Cooperative Living Project WagnisArt, will be exhibiting paintings by Quint Buchholz from June 7 to August 4, 2018. 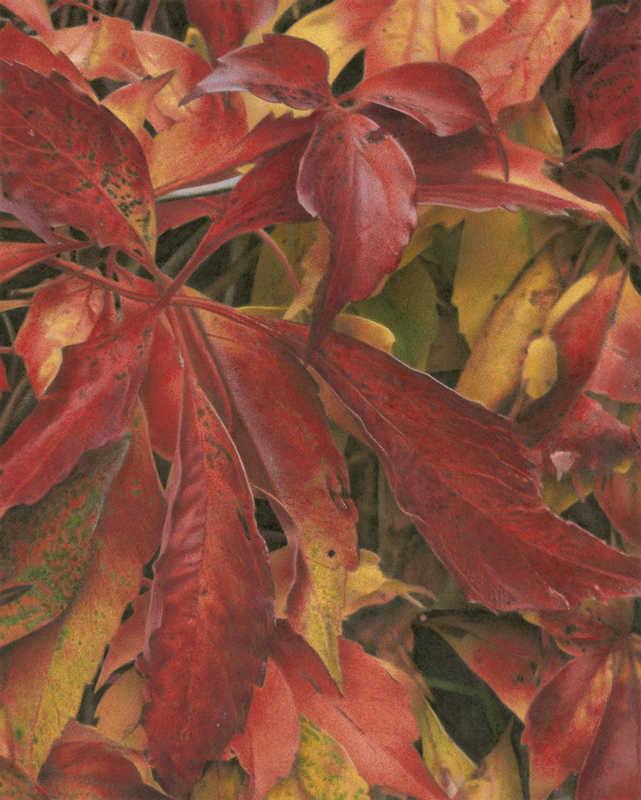 The display will consist mainly of large-format works. Two events will complement the exhibition. 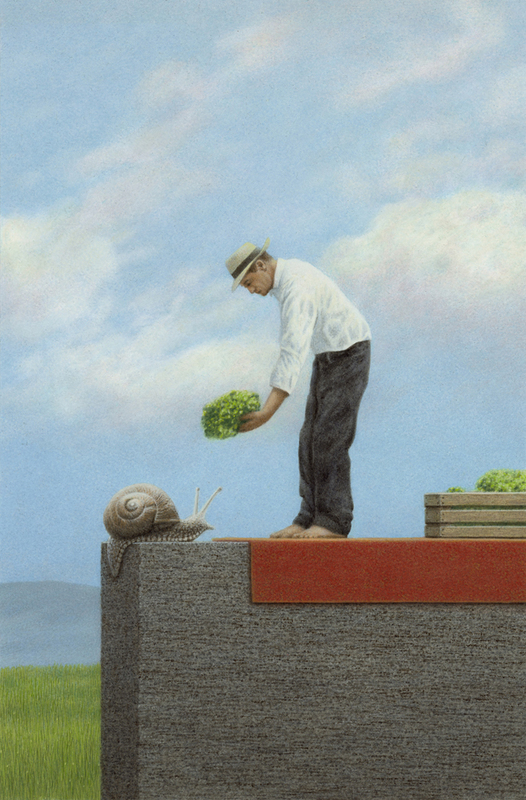 On June 27, Quint Buchholz will be reading from some of his books at Gasthaus Domagk. And on July 25, the restaurant will be hosting another reading accompanied by a high-class vegetarian dinner. More information about the readings and dinner is available on the Gasthaus Domagk’s website. Reading on June 27, 2018, 7 p.m.
Dinner and reading on July 25, 2018, 7 p.m.
Monday through Wednesday 11:30 a.m. – 3 p.m.
Thursdays and Fridays 11:30 a.m – 11 p.m.
Saturdays 5 – 11 p.m.
From July 6th to August 4th, 2018 the Gallery for Illustration in Landsberg will be showing book illustrations by Quint Buchholz. 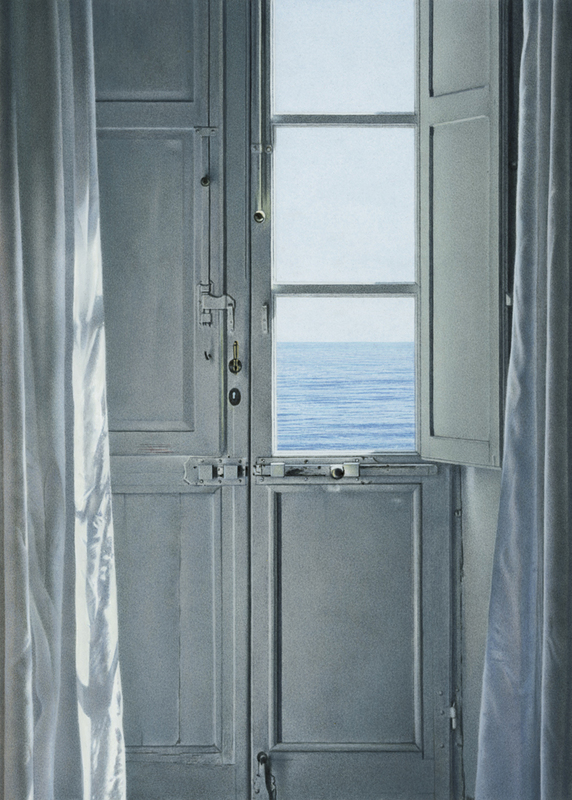 The exhibition will open with a vernissage on July 6, during which Quint Buchholz will also be reading from his books. The traditional artist interview and a discussion will take place after the reading. 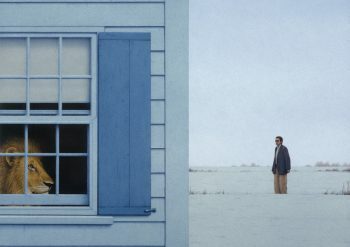 Another special reading will be hosted by the gallery on July 27: the Munich actress and professional speaker Julia Cortis will be presenting a range of texts, accentuated by pictures by Quint Buchholz. More information about the exhibition and readings, as well as tickets for the event on July 27 are available through the ArtGallery Landsberg’s website. 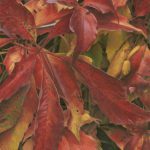 Vernissage and reading on July 6, 2018, 7 p.m.
Reading with Julia Cortis on July 27, 2018, 7 p.m.
Thursdays and Fridays 3 – 6 p.m., Saturdays 11 a.m. – 4 p.m.
From September 20 to November 3, 2018 the Süßkind Gallery near the Augsburg city center will be showing paintings by Quint Buchholz. Most of the small- and large-format pictures and illustrations will be on exposition at Dominikanergasse but a number of prints and books can also be admired at the Bookshop by the Fruit Market. On the first evening the exhibition will open with a vernissage and the traditional artist talk, moderated by Simone G. Bwalya. A week later on September 27, Quint Buchholz will be reading from his latest book “Sun, Moon and Evening Star” (Sonne, Mond und Abendstern) at the Bookshop by the Fruit Market. The musical framework will be provided by professional cellist Ruth Rossel. More information on the event and registration is available on the website of the Bookshop by the Fruit Market and on the Süßkind Gallery’s blog. 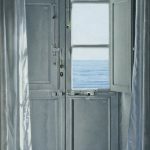 September 20, 2018, 7:30 p.m.
Tuesday through Friday 10 a.m. – 6 p.m.
September 27, 2018, 7 p.m.
At the beginning of September 2018, Quint Buchholz and Dorothée Kreusch-Jacob will present their book “Sun, Moon and Evening Star: The Great Collection of Lullabies” (“Sonne, Mond und Abendstern: Das große Liederbuch zur guten Nacht”, Hanser, 2017) in Gustavsburg. On this occasion they will talk about the idea behind the book, and the music pedagogue will perform a number of pieces from the collection. 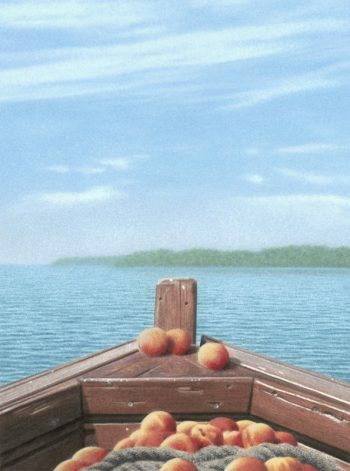 Quint Buchholz will also be present the day after, when author and illustrator Anke Bär from Bremen will read from her new book “Cherry Thieves or When the War Was Over” (“Kirschendiebe oder als der Krieg vorbei war”, Gerstenberg Verlag, 2018) at the same bookshop. More information about the two events will be posted here and on the website of the bookshop at Villa Herrmann shortly.